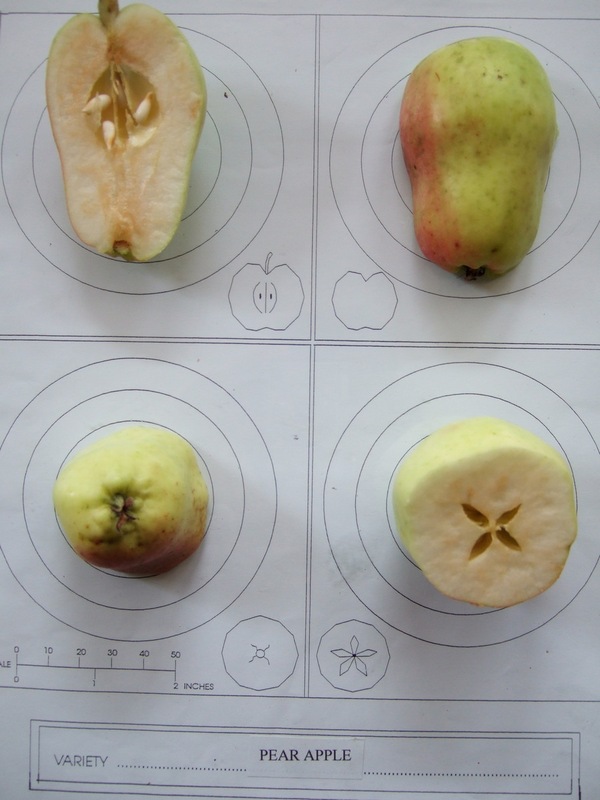 Fruit: Shape – Reverse pear, long, large. Skin – Dry becoming waxy very quickly. Yellow/ green colour with small grey lenticels. Russet on stem or eye only. Flush, usually a trace, diffuse pink/orange. Flesh – Crisp and tender, creamy. Yellowish colour, skin tough/chewy and bitter Flavour – sweet, fruity with a tang when just ripe. Aroma – pear scented, fruity. Uses: Dessert – sweet, goes woolly quickly. Culinary – N/A (cooks to a pale yellow fluff, good for baking.) Juice – pleasant (best made just after picking) sweet if made after some storage. Yellow in colour, slightly scented. Cider – light, useful with other early apples. Recommendations: An interesting early apple if only for the shape, causes great interest in displays! Grows well in the West Country though not particularly vigorous. Very useful for juice making and early cider.